On October 2nd (first Sunday after the feast-day of Saint Romanus the Melodist) the diocese of New York and New Jersey marks its first “Choir Appreciation Day.” Faithful of the diocese are encouraged to recognize the importance of dedicated parish choir leaders and singers, and to celebrate the God-given talents of their choir members while expressing gratitude to them (and God) for their musical ministry. On this day, Bishop Michael especially recognizes singers and directors with twenty-five years of ministry as Orthodox musicians. The Diocesan Commission on Liturgical Music has provided certificates and icon pins (Saint Romanus) for parish rectors to distribute to these eminent choir members. Saint Romanus was born in the fifth century in the Syrian city of Emesa of Jewish parents. After moving to Constantinople, he became a church sacristan in the temple of Hagia Sophia. The monk spent his nights alone at prayer in a field or in the Blachernae church beyond the city. He was not a talented reader or singer. Once, on the eve of the Nativity of Christ, he read the Kathisma verses. He read so poorly that another reader had to take his place. The clergy ridiculed Romanus, which devastated him. On the day of the Nativity of Christ, the Mother of God appeared to the grief-stricken youth in a vision while he was praying before her Kyriotissa icon. She gave him a scroll and commanded him to eat it. Thus was he given the gift of understanding, composition, and hymnography. 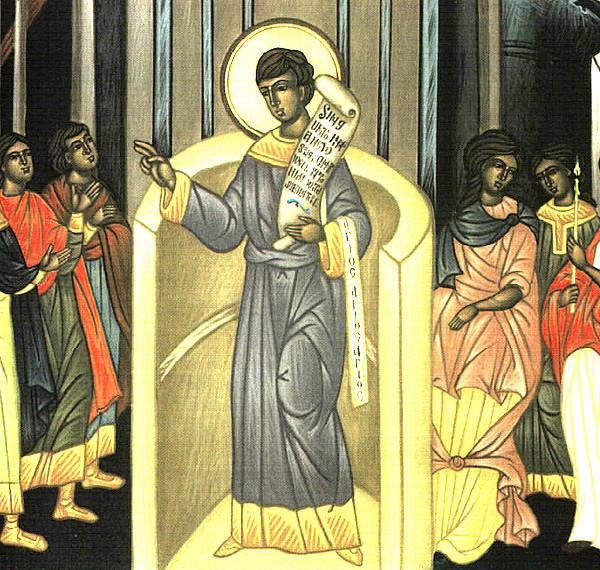 That evening at the all-night Vigil, Saint Romanus sang, in a wondrous voice, his first Kontakion: "Today the Virgin gives birth to the Transcendent One..." All the hymns of Saint Romanus became known as Kontakia, in reference to the Virgin's scroll. Saint Romanus was also the first to write in the form of the Oikos, which he incorporated into the all-night Vigil at his places of residence (in Greek, "oikos"). For his zealous service Saint Romanus was ordained as a deacon and became a teacher of song. Until his death, which occurred about the year 556, the Monk-Deacon Romanus the Melodist composed nearly a thousand hymns, of which about eighty are still used by Christians to glorify the Lord.